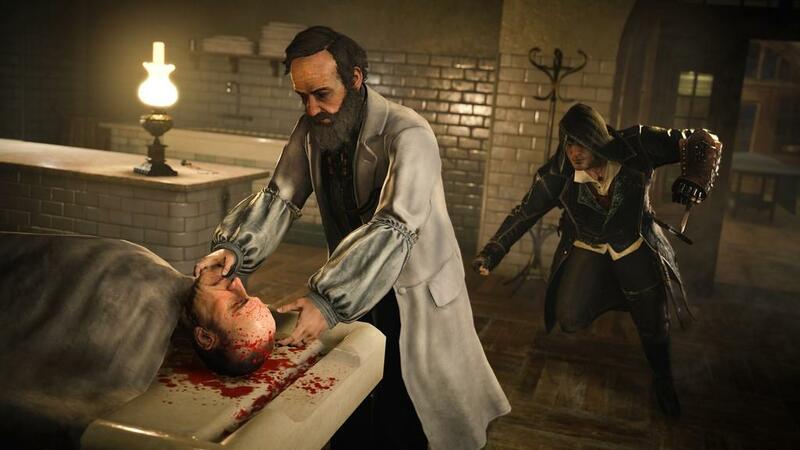 Assassin's Creed has become a gaming institution. Over the years it has become one of the heavyweight franchises, but a few recent missteps have had fans wondering if maybe the series had lost its touch. The release of Assassin's Creed Unity last year was a disaster, and alongside games like Battlefield 4, was one of the biggest nails in the coffin of gamers' faith in big video game companies; Ubisoft's reputation had been treading water for a while already. 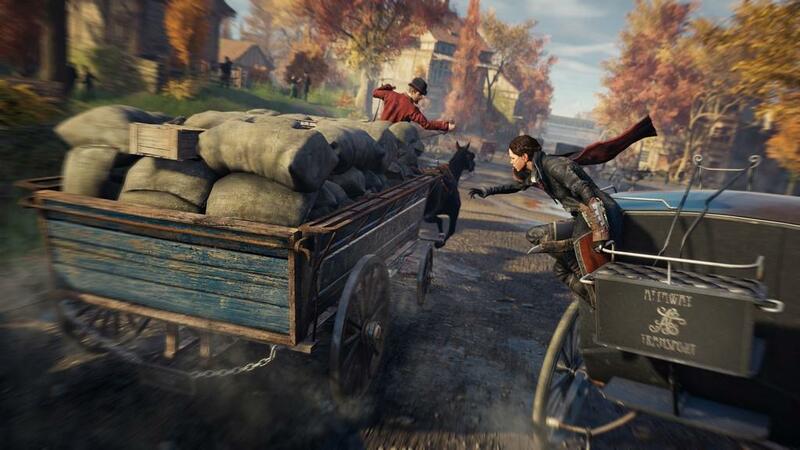 Even so, it's hard to find someone who won't agree that the earlier Assassin's Creed games were amazing, which is why I'm so excited to be able to say that Assassin's Creed Syndicate is the best entry in the series since Assassin's Creed II. Syndicate does almost everything it sets out to do with aplomb, not only managing to innovate, but also, and perhaps most importantly, managing to recapture the spirit of adventure that was so tangible in the earlier entries in the series. 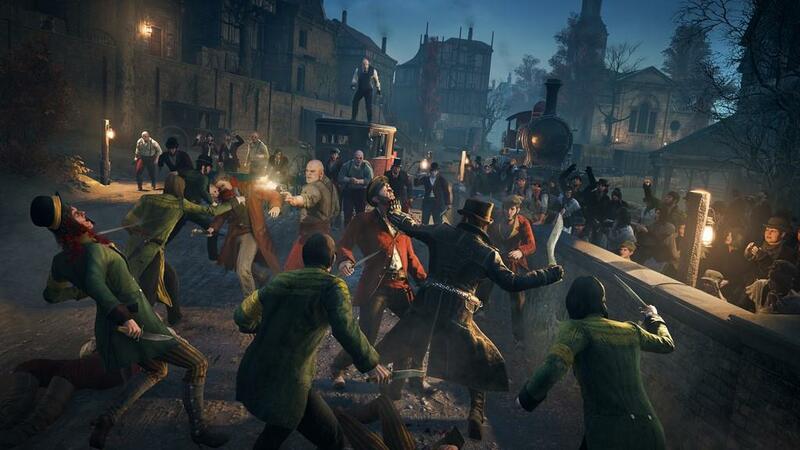 Syndicate takes place in London, in 1868. Leading up to the game's release, the setting was my biggest concern. 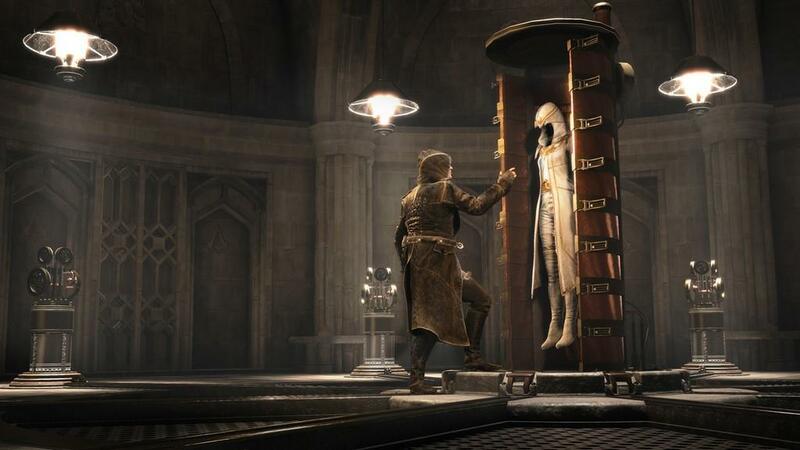 One of Assassin's Creed's biggest claims to fame is its ability to recreate a (relatively) historically accurate time period, and I was desperately hoping they weren't going to go for some kind of quasi-steampunk landscape filled with giant gears and electrified top hats. Thankfully, that's not the move they made at all. 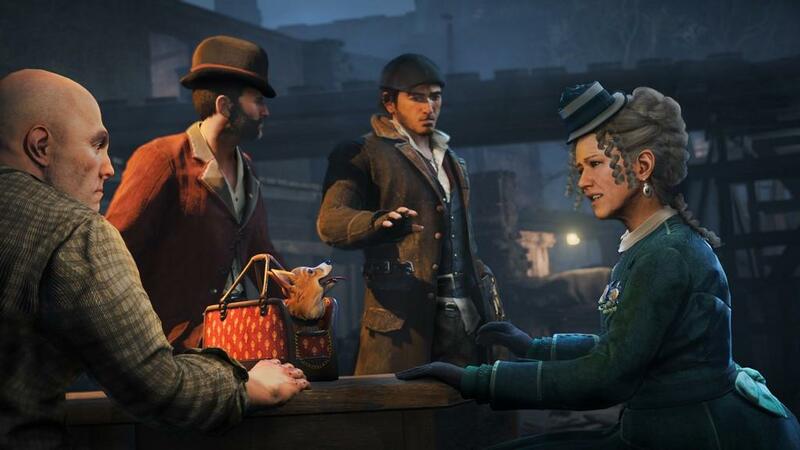 Syndicate is very much Victorian London rather than industrial revolution London, and it benefits immeasurably from that. They easily could have gone with a smoggy, muddy Dickensian London, and while there are definitely grimy parts of the city, most of your time is spent in the beautiful parts of it, made even more beautiful by the game's incredible graphics. Think more Downton Abbey, less The Jungle by Upton Sinclair. The series is also approaching what I think is critical mass in terms of modernity; I'm putting my foot down and saying that any time period post-WWI is too recent for Assassin's Creed. 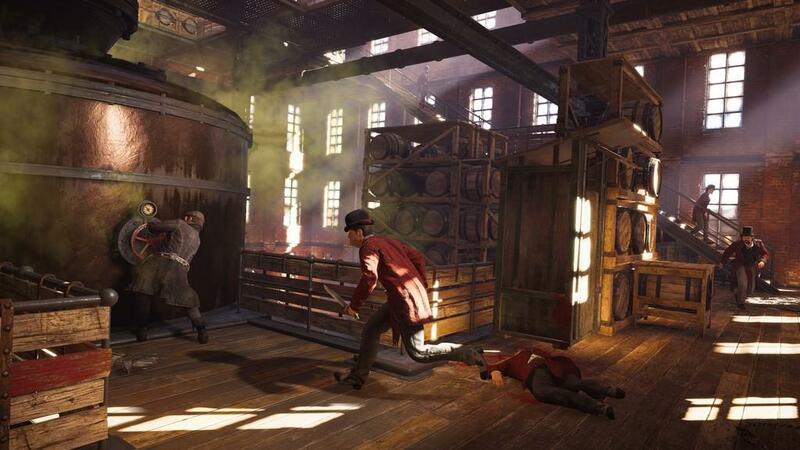 Even Syndicate starts to lose a bit of the trademark historicism the series is known for, by adding revolvers, driveable vehicles (which add a distinct element of Grand Theft Auto into the mix), and losing some of the melee combat focus. It still definitely works, as of now, but if it keeps going the way it's going, before too long it will become The Saboteur. 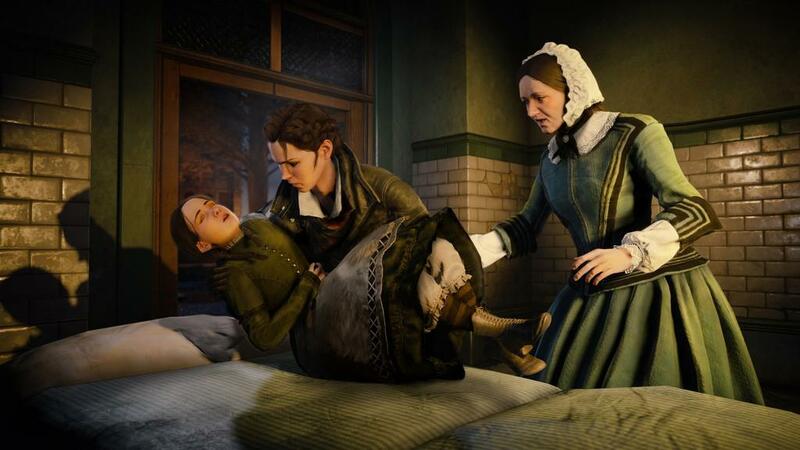 Syndicate's story is held up by the two main characters, twins Jacob and Evie Frye. I feel 100% comfortable in saying they are the best characters the series has ever had. 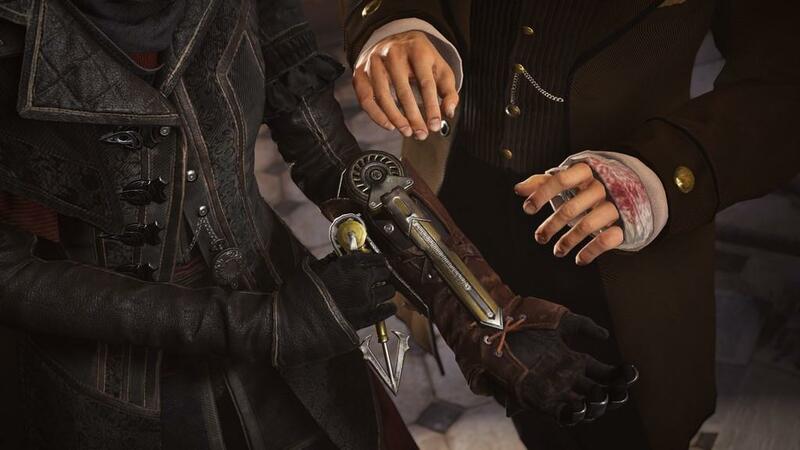 Because of the excellent writing, voice acting, and facial animations, these two feel more human than any previous assassins, and really more human than most video game characters in general. It's impossible to overstate just how lovable these two are. One could liken them to the two halves of James Bond: Evie is Bond's suave, secret agent half, and Jacob is his action star, martini-guzzling and explosive half. They are both so much more nuanced than that, though, and as if they weren't interesting enough as individuals, their relationship is such a believable, sometimes harmonious and sometimes dissonant, brother/sister dynamic. Their personalities are reflected in their playstyles as well. As you progress in Syndicate, you get skill points that you can assign to perks in three separate trees: Combat, Stealth, and Environment. 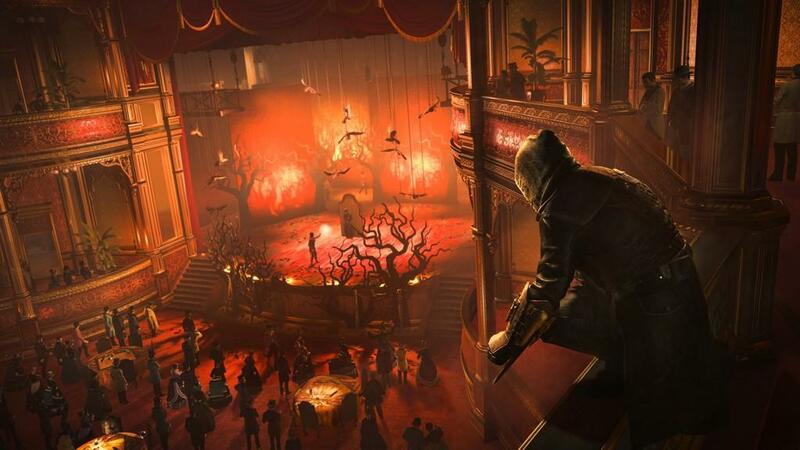 Each Assassin has a handful of character-specific skills that only they can unlock, and this leads to each one serving a specific purpose to the player and having specific styles of missions. Evie's skills are made to make her as silent and efficient as possible, and Jacob's skills are designed to make him dish out the most damage and survive the longest in all-out combat. There's plenty of overlap between the two, thankfully. 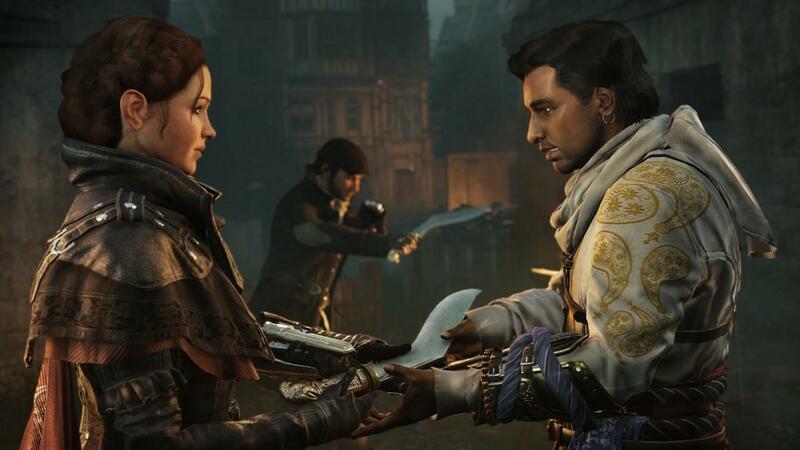 Jacob is still perfectly capable of being stealthy and Evie is perfectly capable of coming out on top of a tussle, but having two characters with two focuses allows players to play the game however they want by quickly switching between characters in the start menu. It's a good job that the two leads are such well written characters, because the story itself would probably not be all that interesting if not told through characters you're so invested in. There's nothing bad about the story other than that there's nothing great about it either; it's pretty standard fare of working your way through the big bad's lieutenants to eventually get to said big bad. Having said that, the main villain is actually probably the most compelling the series has seen. We get to know him a lot better than we usually do, and while he is obviously the bad guy, the game does a good job of making you understand why he is the way he is. He is an intelligent and soft spoken man, and as such his villainous monologues go beyond mustache-twirling and into explanations of a genuine, believable motivation. It's a shame the rest of it so by-the-numbers, because with a less generic plot, the villain could have gone from good to great. Even though the overarching story might be a tad on the generic end of the spectrum, the missions themselves are way on the opposite end. With the notable exception of a few missions towards the end, each memory sequence in Syndicate feels unique and they're a total blast to play. 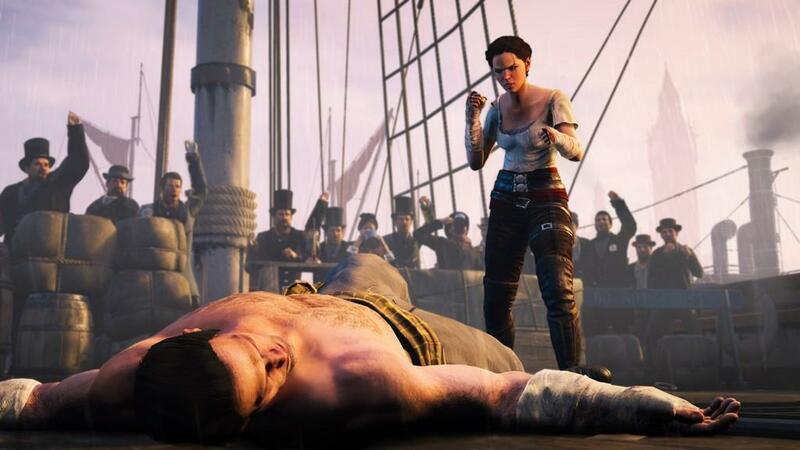 Each mission is catered toward the character you're supposed to play it as, with Evie's being the more traditional Assassin's Creed style missions, and Jacob's being more driven by action and some occasional set pieces. 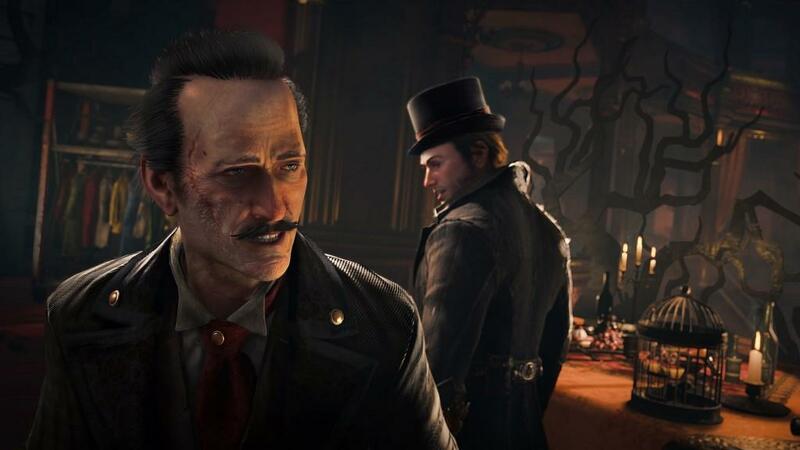 The game is presented in a very cinematic way as well, particularly with the big assassination missions that take place at the end of each act, which are definitely the highlight of the game. 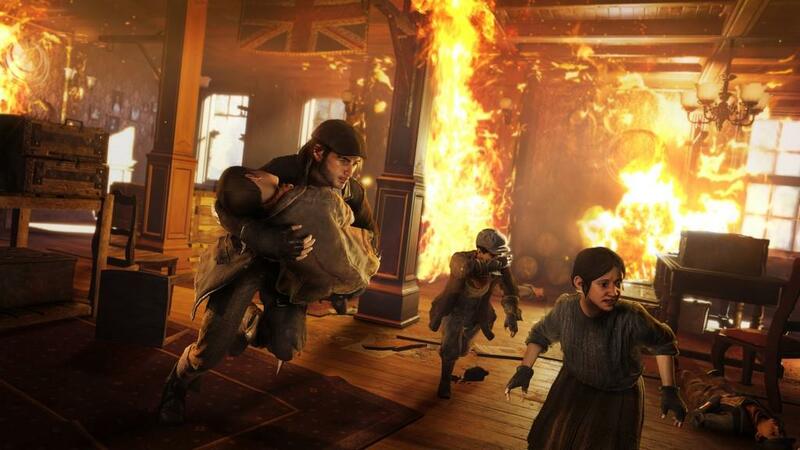 These sequences usually involve the player infiltrating some iconic landmark in London, with an open sandbox mission and multiple ways to pursue your target. They also have a set of little bonus objectives that make the assassinations much more colorful. For example, one of them suggests that you distract a waitress and poison her pitcher of ale to kill a group of enemies, rather than to just wait for them to be alone and jumping on them. They're little touches, but they go a long way to keeping each mission interesting. The free-running and climbing mechanics have been improved, but they are still a little touchy and either too responsive or not responsive enough from time to time. It's not enough to detract much, because for the most part the movement is the best it has been in a while. A particularly massive and frankly game-changing addition to the Assassin's utility gauntlet is the grapple-hook-launcher-thing. One of its functions is almost exactly like the grappling hook from the Batman Arkham games, allowing players to fire a rope at the top of a building and very quickly rappel up to the roof. It also lets you shoot a rope from one roof to another, and then use it as a sort of tightrope to move across empty spaces between rooftops. This is a hugely valuable ability for nearly every scenario in the game. It lets your assassin move quickly and unseen from one vantage point to another, lets you set up air assassinations on targets below, and even just traverse the city as you move from mission to mission. 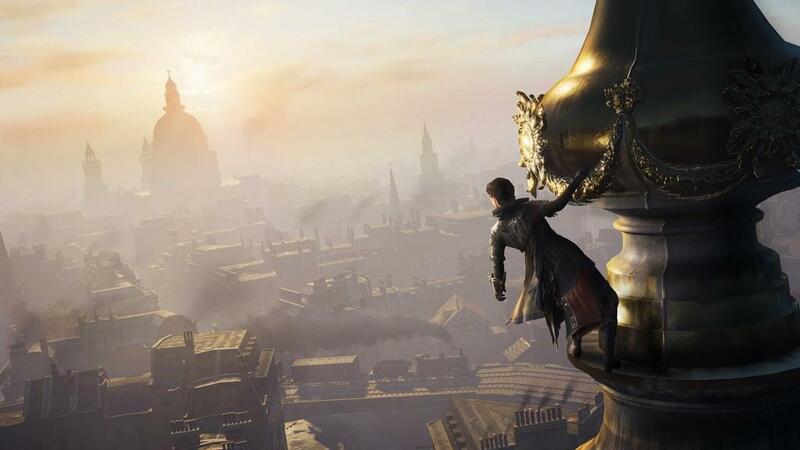 At first I had mixed emotions about the ease in which you can ascend to viewpoints with this new device, thinking it might take away some of the Assassin's Creed spirit by letting you bypass the climbing, but now I dread returning to a previous entry where I won't have access to it. It does change the way the game plays, but I think it's a change for the better. The combat has similarly been streamlined, as have your armaments. 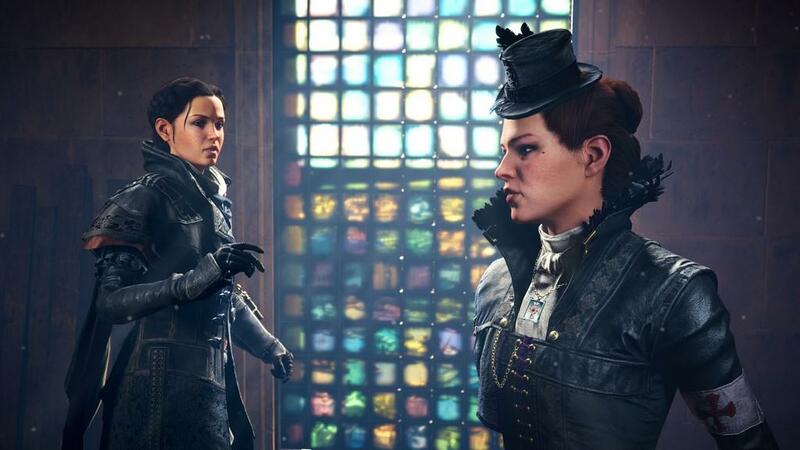 Perhaps as a response to the borderline obscene amount of customization in Assassin's Creed Unity, the options for your characters has been toned down a fair bit in Syndicate. It's not necessarily bad, although I did enjoy the seemingly limitless selection of clothing and weapons in Unity. Syndicate provides you with three melee weapon types: kukris, brass knuckles, and cane swords. There are two or three of these available per level-up, encouraging you to upgrade your equipment as you progress. The same goes for your revolvers and outfits, although there are only a handful of each of those. By narrowing down your options in such a way, it feels less like customization and more like just upgrading your gear as you move along, which is a little disappointing but nothing too major. The combat itself is very fast paced, and it's a blast every time it happens. Each fight consists of a only few blows before one of you is dead; you have a pretty limited amount of room to make mistakes, which makes each fight tense and satisfying. The final and, sadly, maybe the most important point to make about Assassin's Creed Syndicate is that, as of now, it works. The current sales numbers indicate that the abysmal launch of Assassin's Creed Unity has made potential buyers of Syndicate nervous about buying it so soon after launch. In fact, it's the second worst selling entry in the entire franchise, only behind 2014's last-generation-only Assassin's Creed Rogue. This trepidation is justified, for sure, but anyone interested in the game can rest easy knowing that it's a fully functional game, and absolutely worth a purchase. I only ran into one glitch in my entire time with the game, and it was merely a minor graphics glitch. 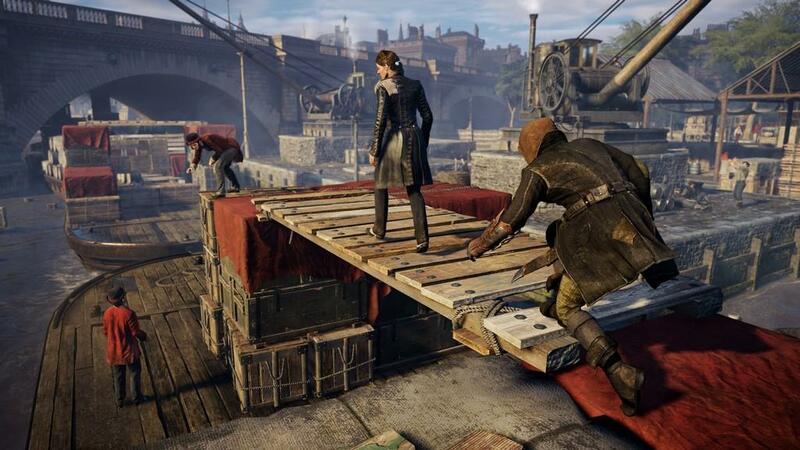 With a stellar cast of characters, a beautiful setting, thoughtful and open ended gameplay, and a decidedly more playable post-launch game, Assassin's Creed Syndicate is the game that many fans of the series have been waiting for. It's easily the best since Assassin's Creed II, and if someone said they thought Syndicate was even better than that, I could entertain the thought with no issue. A few storytelling and movement hiccups along the way keep it from being everything it could have been, but it comes pretty blooming close to it's maximum potential all the same. With a stellar cast of characters, a beautiful setting, thoughtful and open ended gameplay, and a decidedly more playable post-launch game, Assassin's Creed Syndicate is the game that many fans of the series have been waiting for.